So I first started talking about going gracefully grey years ago. I first posted about it on A Tray of Bliss back in April 2014. Everyone thought I was mad of course. But now, it's trendy to be grey. Young people are dying their hair grey. Strange but true! I always knew there'd come a day when we silver haired lovelies would be seen as trendsetters. Here's where I was in April 2014. Above the first pic in this post, is what I am aiming for. I'm very happy with it and it's been worth the angst. Honest. Mimi, that looks fabulous. I thought that was you in the first photo...all fit and trim, bright eyed and bushy tailed although I couldn't see your eyes of course ;-) I dyed mine until the year I retired as I was working at a school and didn't want to look too old, so I gradually lightened my hair and the last time I got it dyed I had blonde streaks put through my previously dark hair and then just let it go grey from then on. It is white in the front and grey at the back and I look forward to it being white all over like my sister's and our mum's hair when she was alive. Whoa! Mimi! I thought that photo that had appeared originally in your April post WAS A BEAUTIFUL PROFESSIONAL MODEL!!!!!!!!!! I'm dead serious! IT SHOULD BE IN A MAGAZINE read by wise women everywhere! Ooh, I love it. You look so elegant! I decided not to continue dying my hair a few months ago (only ever did blondish foils) and I had one lot of my own mousy-brown hair colour put in as I am growing out the colour residue. Now I have my own mouse brown interspersed with grey, and I am finding I don't care at all, and don't know what I was fussing about five years ago when I saw that first grey hair and raced to the hairdresser's! That top photo is very dramatic - I have a two friends not even forty who went silver like that at before they were 35, first they dyed, now they have both embraced their beautiful natural silver. Mine will be salt-and-pepper for years, I am sure, but I will try and keep it nicely cut. The thing about your natural hair colour is it ALWAYS matches your skin tone beautifully, and doesn't have that 'off' look that some dye gives..
Oh, wow, I think you're beautiful, and so is your hair! Beautiful! Mine gray is all grown in and everyone loves it except me. Having a hard time loving it. I won't go back to coloring because I love the freedom of using any shampoo I want. My hair is quite thin and I think that's why I don't like it. Yes, Mimi's right. 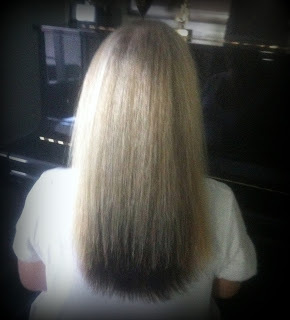 I've never colored my red-turning-chicken-yellow hair, but I noticed as I hit my 50s, it's thinning drastically. (Also as a result of hyperthyroidism.). My husband picked up Head 'n Shoulders for men, "Full and Thick" and I tried it. (DON'T get the 2-in-1 which has limping conditioner in it!). I use nothing else on my hair now. Also, when it's wet, I blow dry it at the roots to thicken the hair there. Finally, I only wash my hair twice a week at the very most. Water and shampoo can be hard on hair. Congratulations to freedom, ladies. You're be.YOU.tiful! Hi my name is Vicki. I have tried some volumizing products with so so results. I will keep on trying to love my hair and I think once the darker gray grows out of the back it will look better to me. My bangs are quite light and I like that. You look so naturally BEAUTIFUL Mimi! I have been thinking about doing the same since I turned fifty, but so far I have been too chicken. My hair is turning white and I love it. The only problem is that when I meet people I used to know they say oh your hair is so much lighter I didn't know you. I have been accused of dyeing it but I haven't. Your hair is beautiful, enjoy it! Looking good Mimi!!! My hair is dark blonde so letting it go grey is easier than darker hair but occasionally i put an ash blonde through it just to even the colour. Mimi I love the look - now I know who I am meeting tomorrow. I have only had my hair coloured once and that was a complete debarkle - the hairdresser didn't listen and it was way too harsh, not just the colouring but the chemicals too. I have more greys (silver) coming in but I am slow compared to my siblings and mum - so still have mainly my brown colouring. Funny I think they grey/silver is only noticable when the light hits them. 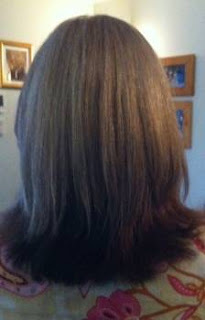 I too am working on going grey..at the moment I am adding blonde foils in to the silver... I don't think it will be too long before it's all grey. I love it! Blessings! The color God has turned your (OUR) hair is ideal, perfect, and beautiful. Why is it we women always want the hair color (not the only item on this list...) we DON'T have?! Welcome, beautiful contentment, for the way things are. Mmmm. I love it! process...........hubby does it now, so it is so much easier and less expensive too. You look so nice with your hair like that Mimi. I would love to have you share some of your posts at my new Monday Cooking and Crafting with J & J party sometime. Thanks and enjoy the rest of the week. Ooooh, I LOVE your hair, sweet Mimi! And I loved seeing a picture of your lovely self :) You are such a delightful lady, my friend. Hugs to you! I think it looks really great on you! I would let my hair go grey if it looked that good. Mine still has way too much dark. I think it would just look dull with the grey mixed in. I would love to be able to not color it. Bravo for going silver! It's gorgeous!!! I've never colored my hair and my first grays arecoming in. I'm calling them God's natural highlights. :) my husband has been greying since his 20's and Ithink it looks distinguished! So eventually, I'll match him! Yours is so striking! Dropping by from Natasha's Down Under. G'Day! I've been happily naturally gray/silver for more than a decade. I have people ask my stylist to copy my color, but she has to tell them it is natural. Your hair looks pretty. I like the dark undertones. It gives it depth.